London, May 11 (IANS): British Indian MP Priti Patel has been appointed employment minister in Prime Minister David Cameron’s new cabinet, BBC reported on Monday. Patel, 43, who comfortably won her Witham seat in England’s Essex county as a Conservative Party candidate in last week’s general elections by getting 57.5 percent of the total 47,339 votes cast, was in 2013 appointed the first ever UK Indian Diaspora Champion. 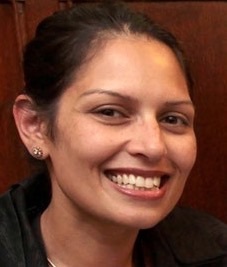 In July 2014, Priti was appointed as exchequer secretary to the treasury in a cabinet reshuffle. First elected to parliament in 2010, Patel has a history of supporting campaigns for small businesses, transport infrastructure investment and affordable homes. The MP’s website describes her as “particularly interested in business, trade and ensuring that British businesses flourish”. Her political beliefs, the website says, in this area “were formed around her own experiences in business, from assisting her parents who have run a number of small businesses around the South East and East of England, to her career in the communications industry, where she worked in corporate communications for a variety of international companies”. Patel’s parents used to run a rural post office in Norfolk. Born in the London borough of Harrow, she became the Conservatives’ first female Asian MP when she won her Essex seat in 2010. After entering Westminster in 2010, Patel has sat on the Tory party’s committee of backbench MPs, and joined the Number 10 policy board last year. She studied economics at Keele University and is married with a five-year-old son. She is a staunch supporter of Indo-British friendship. She said that in Britain 1.5 million Indians are working and contributing to the British economy.